Assyrian Church News, the official news website of the Assyrian Church of the East is pleased to announce that the Voice of the East periodical is now available on Assyrian Church News. 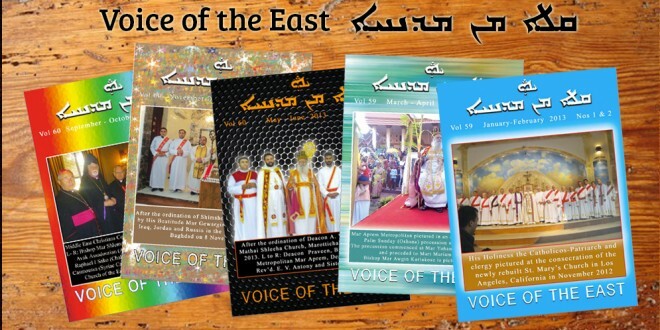 Voice of the East is a socio-religious bi-monthly magazine published by the Assyrian Church of the East, Archdiocese of India. The present patron and publisher of the Voice of the East is His Beatitude Dr Mar Aprem, Metropolitan of Malabar and All India. 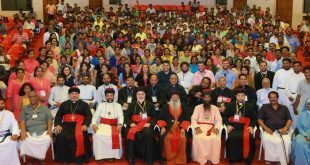 The magazine was first published by the Youth Association of the Church of the East in India in October 1954 and has been published continuously since. In October 2014, it will mark its 60th anniversary. The founding editor was Mr M.P. Inasu (then General-Secretary of the Youth Association) and the first publisher was Mr Jose Davis Mooken (elder brother of the current Metropolitan of Malabar and All India). In its early years of publication, the Voice of the East also included articles in the Assyrian language. However, this has not been the case in recent years with the contents now solely in English. Assyrian Church News has made all back-issues of Voice of the East since 2010 available here for unrestricted viewing and for free download in PDF format. New issues will also be uploaded as they are published. The entire series of back-issues for other years will progressively be uploaded in the near future also.